Bill Anderson before and after his 140 lb. weight loss. There is a way to lose weight that is scientifically proven to work. There is no wondering if it works. It’s based on irrefutably reliable science, as reliable as the law of gravity. It has never failed. If you eat this scientifically proven way to lose weight, you can have full confidence that you will lose weight, as surely as you know that things fall down, not up, when you let go of them. You can even learn how to keep it off. I know, because I was able to apply it after 25 years of failing with unhelpful diets. I finally solved my weight problem and lost 140 pounds 35 years ago. I have kept it off since and made it my mission to teach others how to do the same. I’m old now, and I forget that young people often don’t know the basics of how to lose weight, so I’ll go over that here. And all the details are in my book. There is no mystery here, but there is lots of misunderstanding about how to lose weight and keep it off. The continuous flow of conflicting misinformation and advice leads people to think that the honest-to-God truth about how to lose weight is not yet known. But it is. The science explaining weight loss, weight gain and weight maintenance has been proven and it has not changed significantly for over 100 years. Your body is a machine that uses fuel, like a car. Instead of burning gas, we burn food, and we measure the amount of energy in food in calories. We have fairly precise ways to measure how much fuel/calories you burn in your activities of daily living, and fairly precise ways to measure the amount of fuel/calories in the food you eat. The calorie counts of all foods are easily found, published in books and websites on the Internet. Packaged foods have the calories on the label, and many restaurants today post the calories counts, required by law. Your body weight is the result of the caloric economics of your body, like your bank balances are a result of your financial economics. If you eat more calories than you burn, you store them as fat. With money, surpluses are good. You get rich. With calories, surpluses are bad. You get fat. If you burn more calories than you eat, you start burning your stored surpluses. That’s great if you want to lose weight. You start to trim down. With money, burning through more than you take in results in debt or worse, going broke or even bankrupt. Very bad. Deficit spending can create problems with finances, but if you want to lose weight, deficits are great! There is a lot of folklore and myth in the media and gossip about weight loss, so you have to be careful about what you believe. For instance, a lot of people think there are “good” calories for weight loss and “bad” calories that make you fat. Nonsense. Some think that carb and fat calories are worse than protein calories, but it’s not true. It’s true that you need good nutrition and a balanced diet to be healthy, but for weight loss purposes, all we are concerned with is the calories. Also, there’s no truth that the time of day that you eat affects whether the calories are stored or not. And the way you combine foods doesn’t matter. You can’t cancel calories if they go in your body. Activity is about the only thing you can do that will affect the way you burn calories. Like I said, the physics is simple. There are devices that can measure your metabolic rate (the rate at which you burn calories) with a method called indirect calorimetry. Hospitals and universities have these machines, and some doctors have hand-held devices that are very reliable if used properly. They measure your respiratory gases and calculate the energy produced by analyzing the oxygen used and carbon dioxide produced by your body’s “internal combustion” of your food. There are a number of calculators online, so I’d recommend verifying what you learn by comparing. 1). Use the weight you want to achieve and maintain the rest of you life. You can learn what you burn at the weight you are now to satisfy your curiosity, but the important thing to learn is how to eat like a person at the weight you want to be. To lose weight, you’ll need habits that get you substantially lower than this, and then to maintain, you’ll need habits that keep you under this, even on holidays and vacations, etc. 2). Use the activity level you know you will sustain the rest of your life. (If you don’t have an exercise habit, use the sedentary level, unless your work is the equivalent of a strenuous workout) Forget about exercising to lose weight if you’re not going to make it a lifetime habit. That’s like dieting. If it’s not the way you are going to live, you’ll just regain the weight when you normalize. So, be honest. Use sedentary if that’s the way you live. 3). Don’t take the advice and recommendations at these websites with the calculators as gospel. I am not endorsing any of them. Just use the calculators to find out how many calories you burn at the weight you want to be. Below are the actual formulas, for those who want to do the actual calculations. You use the Miflin-St. Jeor equation to find what your resting metabolic rate is (RMR), then multiply it by your activity level. Note that weight is expressed in kilograms and height is expressed in centimeters. These estimates are very accurate, and unless you have a real metabolic disorder, like thyroid disease, you can depend on them. If you think you have a “bad metabolism” due to an unusual physical condition, check with your doctor, and get it treated if you do. Like I said, the physics are simple. The psychology is not. Some people think weight control is simple — just eat fewer calories than you burn. It may be simple for some people, but for most of us, it has not been simple or easy. And it was not just hard — it was impossible. For me, counting calories was miserable and impossible, as bad as the diets I had failed at. I just couldn’t get to first base to get my eating and my caloric intake right. They thought they knew how to have self-control and form good habits. It turns out they really had no idea. They had self-control and good habits, and they thought it was because they just decided to have them, with their will. That’s not the way it works. Habits and will power are created by training with behavioral psychology techniques. They had been trained with technique they were not even aware they practiced. It wasn’t until I became thoroughly educated in behavioral science, as a behavior therapist, that I was able to succeed with weight loss. It was in learning techniques of conditioning and what I call therapeutic psychogenicsthat I learned how to change myself and have the habits, will power and lifestyle of a person with perfect weight control. These are almost magical “mind control” techniques, like hypnosis, which cause us to think, feel and behave the way we do. It’s not just a matter of making up your mind. Your new way of eating and living has to be enjoyable. We won’t do something we hate for very long, and we are hard-wired to seek pleasure.Fighting that is like fighting your need to sleep or go to the bathroom. You won’t win. Your way of eating has to include the foods you like, and the things you like to do. The first law of behaviorism is that “a behavior that is rewarded will be repeated”. It’s called conditioning with reinforcement.When we do something that feels good, drive is created (which we experience as desire, urges or cravings) to do it again. That’s how we grow habits and get addicted to things. So, we will have to learn what we can do that’s enjoyable that also fits our calorie budget. And then we need to practice it, over and over, so the choices and portions become our habits. We will also need to learn what won’t fit in the budget, and abstain from them for all time. Otherwise, we will reinforce overeating and create drive, desire and craving for the things that make us overweight. You will have to work hard and keep an accurate written record of calories for a while, until the right eating patterns become your habit. It’s a pain, but it’s absolutely necessary. Eventually, you’ll develop a “sixth sense” about calories so that eating the right way becomes automatic. Then, eating to maintain is not hard at all. But it won’t happen unless you put the work in up front. After a while, it becomes your new normal. When you are eating what you like in the right portions and pattern rather than following some diet you want to quit, you’ll have habits that will make you become and stay the weight you want to be. To lose weight at a rate that will be gratifying, you’ll need to reduce your caloric intake by about half, (usually to approx. 1000 for women, 1500 for men). When you start out, you’ll find that a lot of the things you’ve been eating are too high calorically to fit in that budget. In my method, we develop a lifetime habit of eating austerely during the week and more liberal on the weekend, so that the average ends up at the level that is effective. That way, you never have to deny yourself the things you like. It becomes a matter of choices, choosing the best ways to spend the budget on a weekday or a weekend day. Our objective is to learn how to eat for life, not diet for a while. We practice delayed gratification instead of self-denial. This is different than “dieting”. Diets are things we can’t wait to quit, so we can go back to “normal”, overeating and regaining. My way is a better way, something we look forward to enjoying every day. Who wants to quit something that makes you feel great every day? We need to win every day. We need a system we can trust that tells us how we did every day, so that we condition in the good habits and condition out the bad ones. That’s how programming works. You get positive feedback about your forward progress that reinforces the behavior. Most people think the scale is the way to measure your progress, but the scale is about the worst way to get feedback about how you are doing. The scale measures mainly the amount of water in your body, which can fluctuate wildly. If you believe the scale is giving you honest feedback about how you did today, you are likely to feel good when you overeat (if you are dehydrated), and feel bad when you eat properly, but are retaining water. It’s a sure way to program chaos and failure into your brain. It’s like malware. We need a way to get positive feedback every successful day to build the habits we need……. Remember what I said in my first point here. Behavioral psychology tells us that our behavior and habits are not so much a matter of choice as they are a result of conditioning. We need a rock-solid way to know we won every day. This is where faith in the science comes in handy. When you believe the reality that science tells us about the number of calories you burn, and you keep track of how many calories you took in, you’ll feel good every day you are under your burn rate, even on the weekend days. If you make a mistake, instead of saying you “blew it” and quit, you just keep track. On the days you are real low, you can visualize the chunk of fat you just burned off. (Undereating by 1000 calories burns 2/3 of a cup of body fat off your body as surely as driving 40 miles burns at least a gallon of gas.) This is reality. You can’t drive around without burning off gas, and you can’t walk around without burning off fat when you undereat. And it happens that day! If the scale says you gained, it’s giving you faulty feedback, measuring water retention. So, believe the science, not the scale, and make sure you register your win every day, whether it is a gold medal day, or just holding your own. If you keep track every day, you can win every day. Even if you screw up, you’ll still feel OK if you keep track. You’ll never have another day where you think you gained 5 pounds after eating pizza or Chinese food and soaked up 5 pounds of water like a sponge. To gain 5 pounds of body tissue in reality, you’d have to eat 17,500 calories above your burn rate. (Each pound of fat stores 3500 calories). So, even on a day where you went over, you’ll see you didn’t do that much damage, easily corrected by getting back to work.A big gain on the scale because of salty or sugary food making you retain water will disappear in a week, and then your deficits will show up. The most important habits we need to develop are the self-programming techniques and the use of habit-forming psychological phenomena. Will power and habits are not acquired simply by deciding to have them. They are acquired through training. These self-programming techniques are proven by real science, but they often sound silly……. How could just imagining yourself like someone else be important? Or talking to yourself? Or eating what you like instead of diet food? ……Some of the techniques are a pain in the neck and don’t seem to have hypnotic power at all, like planning ahead or looking up and writing down the calories in what you eat. But there is magic in them…… Yes, it’s easier to just buy a pre-packaged diet meal plan, but it will not produce the neurologicalchanges we want. The most important work often looks silly and unimportant compared to the practical stuff, and people sometimes decide to skip what they don’t find sensical. Don’t do that. The techniques people skip are usually the most important things you need to do. You will have to reject what America has come to accept as normal. We have grown up in a culture that has made itself obese. What we’ve come to accept as normal is an obese way of life. The habits, customs and beliefs in America are what make people obese. It’s so much a part of our life that there is a strong tendency to think they are normal, that we should be able to think and live that way and not be fat. But to succeed, we need to reject that way of thinking and living, and start swimming against the stream. The portions we have come to accept as normal in restaurants are two and three times what they need to be. The foods they sell us are as dense, calorically, as you could make food. Our society thinks eating is a form of entertainment, a hobby or pastime. It can’t be, if you want to lose weight and keep it off. We can enjoy eating, but it needs to be in a different way. I enjoy eating more than when I was chronically overweight, but it is no longer something I do to pass the time. It is not my leisure-time activity or a kind of entertainment in my free time. Our goal is to create a new way of being, and we need to be this way the rest of our lives. Like brushing and flossing, it’s not really hard work, but we need to get up and do it every day the rest of our lives if we want the good health and happiness that results from it. There is no retiring from doing what it takes to maintain a good weight. It’s work at first, some of it hard, but after a while, it becomes easier as you develop the knowledge, the skills and the habits. Then it becomes routine. It’s a routine we need to keep. Like learning a sport or a musical instrument, you’ll have to master something that’s difficult at first, and practice. At first, like playing an instrument, it may seem very hard or impossible to practice the techniques that create self-control. Because of that, many people quit and look for an easy way. As it is with a sport or music, there is no alternative to learning and doing what’s uncomfortable and difficult at first, and then practicing it until you get good at it. That’s how it becomes second nature. Trying to avoid the difficult work only keeps you from succeeding. It does get easy, but it takes a while. Then it becomes the new normal. For me, the new normal is so much more pleasurable than the old normal. I love the game, winning every day, and I love being at my preferred weight. You will too. William Anderson is a Licensed Mental Health Counselor, the author of “The Anderson Method of Permanent Weight Loss” (paperback and Kindle at Amazon, audiobook at Audible). He was obese until his early thirties when he found the solution. 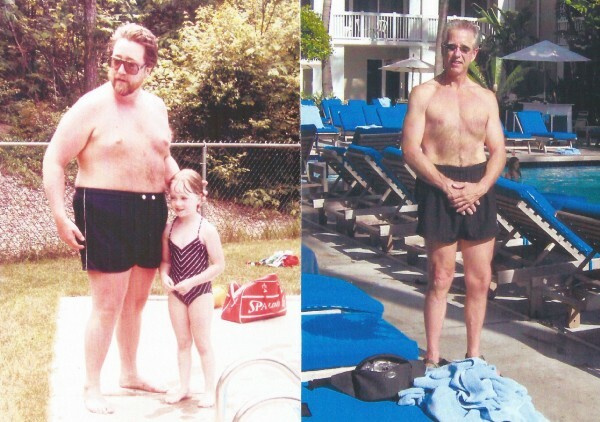 He lost 140 pounds, has kept it off for 35 years, and has taught thousands to successfully manage their weight.